The Adrestia is a high-powered blaster platform specially commissioned for the 8th Alliance Tournament. While similar to its sister vessel the Deimos (on which its design was based), this ship nonetheless differs in some very important ways. Utilizing lightweight alloys and a prototype form of ion thruster, the Adrestia is capable of reaching truly mind-boggling speeds for a heavy assault vessel. While this makes it less sturdy than its predecessor, the lack of defensive plating is compensated for by state-of-the-art targeting systems, thoroughly optimized weapon hardpoints and upgraded warp scrambling capability. Don't let the lack of defense fool you; very few vessels out there can stand against the Adrestia toe to toe. 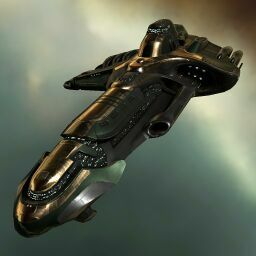 The Adrestia is a limited-run version of the Gallente Deimos. A set of 50 ships were given to the over-all winners of the 8th Alliance Tournament, Pandemic Legion. So far, only one is confirmed destroyed, bringing the total of remaining hulls to 49. Whether Pandemic Legion still owns the remaining all the remaining hulls or if any have been stolen or sold is a mystery, and it's doubtful they would release such embarassing information lightly. Further information about additional or recommended skills to pilot Adrestia for a specific or it's common role(s) can be written here. No tagged fittings for Adrestia. No sub-article about Adrestia roles or piloting tactics. You can write them here. This ship is now (2013) very rarely offered for sale and almost never flown. This page was last modified on 31 December 2016, at 11:01.